Telecommunications technologies use electronic signals over cables and the electro-magnetic spectrum to allow people to send and receive information quickly over great distances. Milwaukee has a history of ever-changing technologies, with varying levels of competition and regulation of the services used to connect Milwaukee to the world. Telecommunication began in Milwaukee when the Erie & Michigan Telegraph Company completed the first telegraph line from eastern cities through Chicago to Milwaukee in December 1847, several years before the arrival of railroads. The first official telegram arrived on January 15, 1848. By 1850, telegraph lines connected Milwaukee to Madison, Green Bay, and other cities. Early telegrams cost $1.00 to New York City and twenty-five cents to Chicago for ten words. 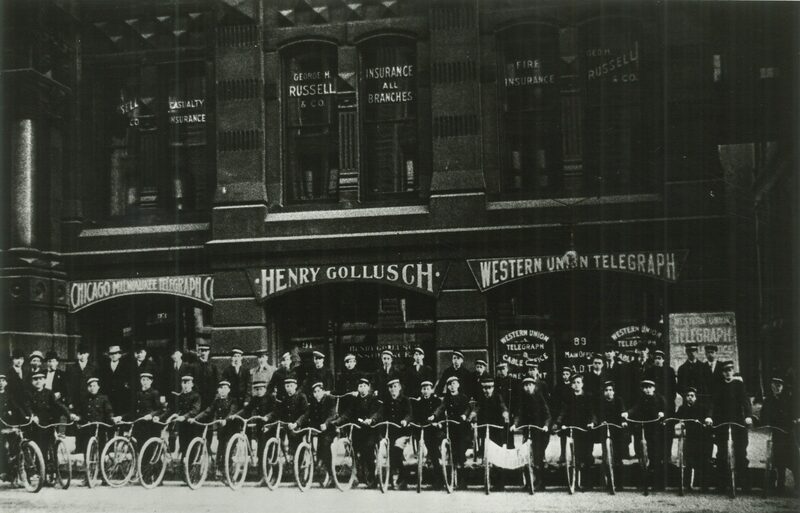 Competing telegraph companies operated into Milwaukee during the nineteenth century, but Western Union Telegraph Company eventually became the dominant provider, starting with its absorption of the Erie & Michigan Telegraph Company in 1854, until it sent its last telegram in 2006. Until well into the 1960s with widespread availability of direct long distance dialing, telegrams were the predominant means of long distance telecommunication. For local communications, the telephone ultimately superseded the telegraph. Charles Haskins brought the first Bell telephone instruments to Milwaukee in early 1877, less than a year after Alexander Graham Bell filed for his patent in March 1876. The first subscriber was John S. George, the local agent of the Chicago & North Western Railway Co. The City of Milwaukee became an early customer for $77 annually when it leased three instruments to connect the mayor’s office in City Hall with the fire and police departments. Haskins himself made and installed the first telephone switchboard in Milwaukee on May 10, 1879. The first operators were telegraph messenger boys, who also delivered the printed telegrams to recipients. But after customer complaints about their rudeness and poor service, women soon replaced them. Mary Kemp, Carrie Bell, and Pauline Juneau (a niece of Solomon Juneau) were the first female operators. On July 7, 1882, Charles Haskins, his son Harry C. Haskins, and Attorney Benjamin K. Miller incorporated the Wisconsin Telephone Company, with a license to offer Bell telephone service throughout Wisconsin. Wisconsin Telephone initially served sixteen exchanges in Wisconsin. 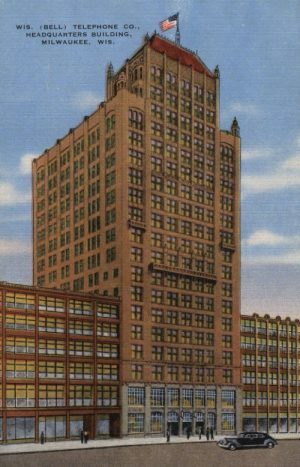 It served 600 Milwaukee customers from the site of the current AT&T Wisconsin headquarters building at 722 North Broadway. The building was constructed in 1917 and expanded to its current size in 1930. Among the many other southeastern Wisconsin communities in which Wisconsin Telephone provided service were West Bend (beginning in 1883 with six phones) and Port Washington (1882). The first long distance connection from Milwaukee to New York City was made in 1892, but it was 1915 before a call could be completed to the Pacific coast. In 1896, a dial telephone system was installed in the Milwaukee City Hall. Wisconsin Telephone introduced the candlestick telephone in 1910, wall phones in 1913, and its first dial phones in 1919. Direct dial long distance calling started in 1956, touchtone pulse dialing in 1964, electronic switching in 1969, and fiber optic cables in 1981. Although Wisconsin Telephone faced local exchange competitors in the first decades of its existence, its pricing policies and refusal to interconnect with other companies severely handicapped both local and long distance competitors. It also aggressively expanded by purchasing independent companies. In 1907 the Wisconsin Railroad Commission initiated regulation of the telephone industry. By the 1920s, regulation and the settlement of federal antitrust lawsuits created a monopoly system that eliminated competition both within exchanges and between adjacent telephone companies. As a regulated monopoly, a telephone company provided all services, and a company employee had to install or move all phones or extensions. All Bell phones were black, until color phones were first introduced in 1956. The Bell System handled all long distance calls, even calls between independent company customers. However, beginning in the 1960s, federal telecommunications policy, driven by changing technology, encouraged competition. Interexchange companies using microwave technology began offering alternative long distance services. Substitutes for company-provided equipment became available, enabling customers to easily buy, install, and move their own equipment. Competitors began offering local exchange services, either by building their own facilities or by reselling telephone company local services. The dismantling of the Bell System in 1984 as a result of the settlement of a government antitrust suit accelerated the transition to a competitive telecommunications marketplace. 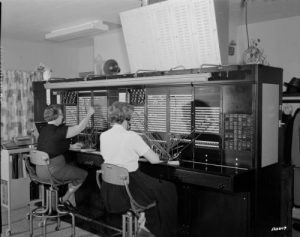 By the end of the twentieth century, the telephone industry in Wisconsin was largely deregulated through changes in both state and federal law. A major factor leading to deregulation was the developing competition to landline telephone service from mobile technologies. Although some mobile service was provided in Wisconsin beginning in 1946, the early radio technology limited it to only a few thousand customers. The new age of mobile cellular telephone service arrived when Ameritech and Verizon began offering the service in the mid-1980s. Other providers soon entered the market, until cell phones became ubiquitous. By 2015, about half of homes nationally obtained their phone service solely through cellphones without subscribing to a landline telephone. Cable television formed another key element of the telecommunications infrastructure. Although seventy-two cable systems operated in Wisconsin by 1972, cable television service did not arrive in the Milwaukee until it granted a non-exclusive franchise to Warner Amex Cable Communications in April 1983. The service started to became operational in December 1984, offering 108 channels using dual analog coaxial cable. Time Warner Cable Inc., the ultimate corporate successor to Warner Amex, began installing fiber optic cable in the late 1990s and upgrading to digital cable service, offering broadband internet access and video on-demand services. In 2005 it became a direct competitor to telephone communications by offering phone service over its cable network using digital broadband internet technologies. AT&T responded in 2006 with its U-Verse television, digital phone, and broadband internet services. Over the years, telecommunications in Milwaukee has seen changing technologies, with differing levels of competitive and monopoly services, both regulated and unregulated. The ongoing rapid transition to digital and broadband internet technologies will accelerate the pace of change and competition across all aspects of the telecommunications in Milwaukee. ^ The Business History website contains an extensive bibliography on telecommunications related subjects, accessed October 28, 2015. ^ Frank A. Flower, ed., History of Milwaukee, Wisconsin, Illustrated (Chicago, IL: Western Historical Co., 1881), 1406; Howard Louis Conard, ed., History of Milwaukee County from Its First Settlement to the Year 1895 (Chicago, IL: American Biographical Publishing Co., 1895), vol. II, 14. ^ “Milwaukee’s First Telegraph Line,” Milwaukee Sentinel, September 10, 1899; Flower, History of Milwaukee, Wisconsin, 1405-8. ^ Ellis Baker Usher, “The Telegraph in Wisconsin,” Proceedings of the Historical Society of Wisconsin for 1913 (1913): 97-99. ^ “Milwaukee’s First Telegraph Line,” Milwaukee Sentinel, September 10, 1899; Conard, History of Milwaukee County, vol. II, 14. ^ Usher, “The Telegraph in Wisconsin,” 97-109; Flower, History of Milwaukee, Wisconsin, 1407-8; Conard, History of Milwaukee County, vol. II, 15-16; “Business History of Telecommunications,” accessed December 10, 2015. ^ 53 Years on Broadway, the Story of a City Block in Milwaukee’s History (Milwaukee: Wisconsin Telephone Company, 1930), 6; Conard, History of Milwaukee County, vol. II, 16. Several people besides Haskins are identified with early telephones in Wisconsin, including Alfred Galpin, an Appleton banker. Harry Barsantee, “The History of the Telephone in Wisconsin,” Wisconsin Magazine of History, vol. 10, no. 2 (December 1926): 151. Richard Valentine of Janesville might have been the first telephone user. Donald C. Rolles, “Wisconsin’s First Phone Used by Janesville Man,” Milwaukee Sentinel, August 20, 1922. ^ 53 Years on Broadway, 13. ^ Edward T. Kaveny, “Council Took One Chance on the Telephone; Three Rented for the ‘Town Hall,’” Milwaukee Sentinel, January 18, 1924. ^ 53 Years on Broadway, 14. ^ “Granddaughter of Solomon Juneau Recalls Early Days as Milwaukee Telephone Operator,” Wisconsin Telephone News, June 1933; Angus S. Hibbard, Hello, Goodbye: My Story of Telephone Pioneering (Chicago, IL: A.C. McClurg & Co., 1914), excerpted in Wisconsin Telephone News, September 1936; 53 Years on Broadway, 15. ^ 53 Years on Broadway, 17; Conard, History of Milwaukee County, vol. II, 16. ^ 53 Years on Broadway, 17-22; Wisconsin Telephone Company—100 Years (Milwaukee: Wisconsin Telephone Company, 1982). ^ By 1900 there were twenty-five Bell telephones in West Bend. Dorothy E. Williams, The Spirit of West Bend (Madison, WI: Straus Printing Co., 1980), 127. Wisconsin Telephone concentrated mostly on providing service in larger Wisconsin municipalities. Some cities, smaller towns, and rural customers were frequently served by “independent” telephone companies, unaffiliated with Wisconsin Telephone or the Bell System. Among the independents was the Menomonee Falls Telephone Company, which provided service in Menomonee Falls, Granville, Lannon, Sussex, and Germantown. Menomonee Falls Chamber of Commerce, History of Menomonee Falls (Menomonee Falls, WI: Menomonee Falls Chamber of Commerce, 1950), 10-11. The Ozaukee-Washington Telephone Company in 1911 absorbed the even smaller Mequon Telephone Company (begun in 1902) and the Freistadt and Cedarburg Telephone Company (begun in 1904). Wisconsin Telephone bought the company in 1925. Ozaukee-Washington Telephone Company Records, 1901-1929, Wisconsin Historical Society, Library-Archives Division, housed at the University of Wisconsin-Milwaukee Libraries Archives Department/Milwaukee Area Research Center. In 1926 there were nearly 1,000 telephone companies, cooperatives, and farmers associations providing service in more than 600 exchanges in Wisconsin. Barsantee, “The History of the Telephone in Wisconsin,” 159. ^ 53 Years on Broadway, 32. ^ Wisconsin State Telephone Association, On the Line: A History of the Telephone Industry in Wisconsin (Madison, WI: Wisconsin State Telephone Association, 1985), 113. ^ William D. Caughlin and Brian F. Coffey, Ameritech’s Legacy in Wisconsin: A Photo History (Chicago, IL: Ameritech Corporate Archives, 1999). ^ David Joshua Gabel, “The Evolution of a Market: The Emergence of Regulation in the Telephone Industry of Wisconsin, 1893-1917” (Ph.D. diss., University of Wisconsin-Madison, 1987). ^ The early contentious relationship between Wisconsin Telephone and the independent telephone companies is summarized in Barsantee, “The History of the Telephone in Wisconsin,” 156-158. ^ 1907 Wisconsin Act 499. The legislative history of the Wisconsin Public Utility Law is discussed in Gabel, The Evolution of a Market, 283-356. ^ E.g., Susan E. McMaster, The Telecommunications Industry (Westport, CT: Greenwood Press, 2002), 32-38; Gerald W. Brock, The Telecommunications Industry, The Dynamics of Market Structure (Cambridge, MA: Harvard University Press, 1981), 148-161. ^ Caughlin and Coffey, Ameritech’s Legacy in Wisconsin. ^ McMaster, The Telecommunications Industry, 91-109, 122-152. ^ U.S. v. AT&T Co., 552 F.Supp.131 (D.D.C. 1982), aff’d sub nom., Maryland v U.S., 460 U.S. 1001 (1983). Wisconsin Telephone Company changed its name to Wisconsin Bell, Inc. effective with its divestiture from AT&T on January 1, 1984. Caughlin and Coffey, Ameritech’s Legacy in Wisconsin. Upon divestiture Wisconsin Bell became a subsidiary of American Information Technologies Corporation (“Ameritech”), the regional Bell operating company offering service in Michigan, Ohio, Indiana, Illinois, and Wisconsin. Ameritech became part of SBC Communications Inc. in 2001, which in turn adopted its current name of AT&T, Inc., after SBC completed its combination with remnants of the post-divestiture Bell System in November 2005. “Business History of Telecommunications,” Business History website, accessed December 10, 2015. ^ The major deregulatory legislation passed in Wisconsin was 1993 Wisconsin Act 496. The key federal law was the Telecommunications Act of 1996, Pub. L. No. 104-104, 110 Stat. 56, codified at 47 U.S.C. secs. 151 et seq. ^ McMaster, The Telecommunications Industry, 114-16. ^ S.J. Blumberg and J.V. Luke, Wireless Substitution: Early Release of Estimates from the National Health Interview Survey, January-June 2015 (National Center for Health Statistics, December 2015), http://www.cdc.gov/nchs/nhis.htm, accessed December 2, 2015, now available at https://www.cdc.gov/nchs/data/nhis/earlyrelease/wireless201512.pdf, last accessed September 3, 2017. ^ Cable Franchise Agreement between the City of Milwaukee and Warner Amex Cable Communications Company of Milwaukee, executed June 1, 1983. Other cable television systems operated in smaller communities throughout Wisconsin as early as 1951 (Rice Lake). Wisconsin Governor’s Blue Ribbon Task Force on Cable Communications, “Cable Communications in Wisconsin, Analysis of Recommendations,” (Madison, WI, August 1972). In 1980 cable service began in Wauwatosa, the first system in the Milwaukee area. Christian Schneider, WPRI Report: The Benefit of Cable Competition in Wisconsin (Thiensville, WI: Wisconsin Policy Research Institute, Inc., March 2007), 8. ^ Cable Franchise Agreement, June 1, 1983. ^ Time Warner Cable, “Making Connections, Time Warner Cable and the Broadband Revolution,” http://history.timewarnercable.com/, accessed December 10, 2015. ^ Schneider, WPRI Report: The Benefit of Cable Competition in Wisconsin, 4. Internet-based technologies, including VoIP (Voice over Internet Protocol), are now being used extensively by telephone companies to provide landline service. See, e.g., William A. Flanagan, Understanding VoIP and Unified Communications: Internet Telephony and the Future Voice Network (Hoboken, N.J.: John Wiley & Sons, 2012). Brooks, John. Telephone, The First Hundred Years: The Wondrous Invention that Changed a World and Spawned a Corporate Giant. New York, NY: Harper & Row, 1976. Coll, Steve. The Deal of the Century: The Breakup of AT&T. New York, NY: Atheneum, 1986. Hochfelder, David. The Telegraph in America, 1832-1920. Baltimore, MD: Johns Hopkins University Press, 2012. Murray, James B., Jr. Wireless Nation—The Frenzied Launch of the Cellular Revolution in America. Cambridge, MA: Perseus Publishing, 2001. Parsons, Patrick Blue Skies: A History of Cable Television. Philadelphia, PA: Temple University Press, 2008.